Cyclists tend to be a data-loving crowd. We’ve got our Strava personal bests, gear ratios, and grams saved by wearing red vs. black socks (only half-kidding on this one). This type of bragging-rights data is part of the fun, but what really matters is the data that shows how bikes are making a difference in people’s lives. Taking a look at what people in different places are doing is a great way to learn what we might do to improve cycling in Asheville, so we decided to put together a fun little quiz on cycling statistics from around the world. Take your best shot—some of the answers might surprise you! Which country has the most bikes per person? The answer is…A! According to research gathered by Bicycle Dutch, the 17 million people in the Netherlands own a whopping 22.5 million bicycles; that’s 1.3 per resident. When you look at the incredible cycling infrastructure in the Netherlands, their top ranking comes as no surprise: the Dutch have 33,000 kilometers (that’s over 20,000 miles) of dedicated cycle paths nationwide, and that’s not including bike lanes on the road—they have another 55,000 km of that! The U.S. actually ranks sixth among the countries surveyed (and last on our list), with 0.3 bicycles per person. The latest figures from the Adventure Cycling Association show that there are only 13,000 miles of approved U.S. Bicycle Routes nationwide, and many of those miles are shared with motorized traffic. People for Bikes reports that we have only 496 protected bike lanes in 116 cities across the entire country. While we have some catching up to do, there is good news: this protected bike lane tally is quadruple what is was a decade ago, and keeps increasing every month. How much did bike commuting increase in North Carolina between 2006 and 2016? Unfortunately, the answer is D 🙁 In an analysis of U.S. Census data by the League of American Bicyclists, North Carolina ranked 45th out of 50 states for bicycle mode share. Charlotte barely made the list of the 70 largest cities with the highest share of bike commuters—it came in 70th place (yes, DFL). The fact Charlotte even made the list is amazing, given the city saw a 65% decline in bike commuters in the decade measured. It’s difficult to pinpoint an exact reason why NC is so low on the commuter list. A combination of lacking infrastructure, longer distance commutes, culture, and terrain may be contributing factors, as well as access to safe roads for riding. Which is the #1 bike friendly state in the U.S.? The answer is…D! Washington is currently ranked #1 among bicycle-friendly states by the American League of Bicyclists, a title it has held since 2008. Boasting 17 bicycle friendly communities, 40 bicycle friendly businesses, and 1 bicycle-friendly university, Washington has consistently ranked in the top 7 of all states in infrastructure, planning, advocacy, education, policy, and bicycle law enforcement for over a decade. Well done, Washington! Where does North Carolina rank? We’re currently #20. While we do well in evaluation and planning, we’re near the bottom when it comes to funding of bicycle-friendly infrastructure and legislation and enforcement for bike and pedestrian safety. Which of these cities cycles the most? The answer is….C! 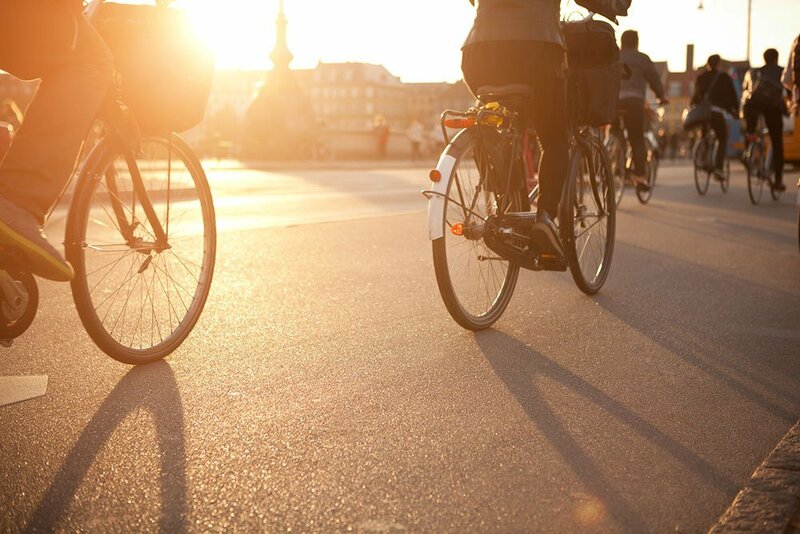 In what is known by some as the City of Cyclists, anywhere from 35% to 52% of the population of Copenhagen, Denmark are estimated to use a bike as their main form of daily transportation. With flat terrain, dedicated bike lanes lining nearly every street, and cycle paths worming around the city, it’s easier to ride a bike than drive in Copenhagen (53% of residents actually said they ride a bike because it’s faster). But it wasn’t always this way—according to the City of Copenhagen website, Copenhagen was as congested with motor traffic as any other major city as recently as the 1960s. It was through a concerted effort and desire for a healthier, more livable city among public leaders, transportation authorities, and the community that Copenhagen transformed its infrastructure—and that kind of transformation is possible anywhere if we commit to change. By comparison, the U.S. city with the highest percentage of bicycle commuters is the university town of Davis, CA. Davis has been investing in protected bike paths and mutlimodal infrastructure for many years. Depending on the year, between 17% and 25% of trips in Davis are made on a bicycle. Many other U.S. cities are working to build bicycle facilities and protected bike lanes. As these facilities are built, it encourages a new segment of the population to travel by bicycle. Portland, for example, changed it’s bicycle mode share from 1.8% to 7% between 2010 and 2015. Their current goal is to reach 25% of commuter trips by bike. In New York City cycling and other forms of non-car transit have grown dramatically since 2010, during a time period when NYC started putting in many bicycle lanes and multi-modal street designs. Over that time period cycling grew from 250,000 annual trips to 460,000 (page 10, NYC 2018 Annual Mobility Report). Did you enjoy our quiz? You can learn more about the facts and figures of bicycling in Asheville by exploring our site. You can also make a difference in improving our cycling stats and making our city a safer, more practical place to ride by joining Asheville on Bikes. We can’t wait to welcome you to the team!